Flexibits has released an update to the Mac version of its popular calendar app Fantastical. The feature that should be useful to most users immediately is the ability to send and receive new time proposals for events. 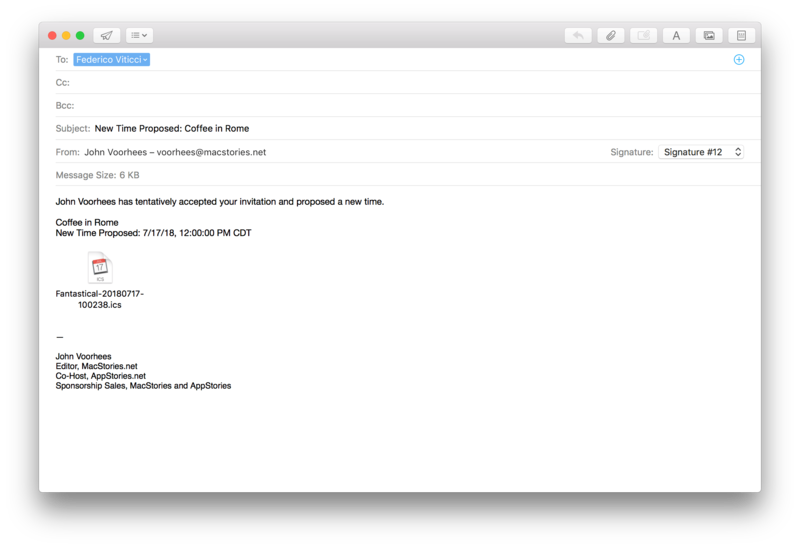 Fantastical already could send meeting invitations and acceptances, but with version 2.5, recipients of an invitation can propose a new time. The feature works with iCloud, Google, Exchange and CalDAV calendaring services, which should cover most use cases. When you receive an invitation and want to propose a new time, double-click the event. In the popup, you’ll see ‘Propose New Time’ beneath the event’s participants. Clicking that expands the section to allow you to pick new start and end times. To send the proposal, click the ‘Propose’ button to open a pre-filled form email in Apple Mail that will be sent to the event’s participants taking much of the data input out of the process of proposing new times. Proposing a new event time generates an email to the event's participants automatically. Fantastical now also supports Meetup.com. From the Accounts tab in Preferences, you can log into your Meetup account. Services like Meetup usually make iCal files available that you can add to your calendar, but with Fantastical integration everything is automatic. In my testing, calendar events for Meetup events showed up in Fantastical within seconds of setting them up on Meetup.com. I’d love to see Fantastical expand this feature to incorporate other popular services like Eventbrite. 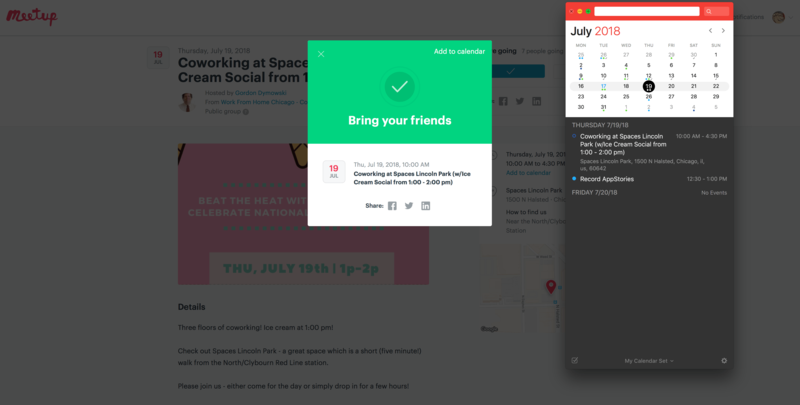 Meetup.com support creates calendar events quickly and automatically. A significant design improvement to Fantastical is how multi-day events can be handled. In the past, if an event like a trip spanned several days, your calendar would block out every hour of each day of the event. Now, there is a checkbox in the Appearance tab of Preferences that displays multi-day events in the All-Day section of your calendar when selected. Multi-day events look so much better with the setting turned on, I’m a little surprised it wasn’t made the new default view. Fantastical now has two ways to display multi-day events. Fantastical 2.5 adds several other smaller changes too. For example, you can press ⌃⌥↑ and ⌃⌥↓ to adjust the start time of an event without affecting its end time. Note, however, that this does not work on events where you are the invitee, presumably because the expectation is that you will propose a new time to the event organizer instead. Also, if you try the keyboard combination on an event where you are an invitee in the mini window, Fantastical crashes. By adding the shift key to the keyboard combination, you can adjust the end time of an event without affecting its start time. Also, holding down the Option key while editing the start time of an event will keep the end time the same. The mini window can now be part of a Split View setup when running another app in full-screen mode. A URL scheme has been added for opening a specified calendar set (x-fantastical://show/set?name=My Calendar Set). There is a preference for showing the current calendar week in Fantastical’s Dock icon or menu bar icon. 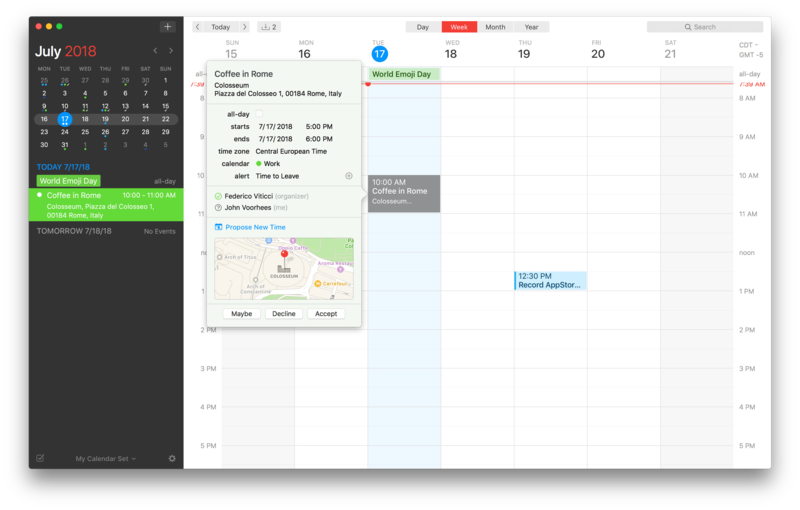 Together the new features introduced with Fantastical 2.5 are substantial additions to what has been one of the premier pro calendaring apps on the Mac and iOS since its debut. Calendars can be a chore to manage and any new feature that automates parts of the process or reduces the steps needed to set up an event are welcome. Fantastical is available on the Mac App Store for $49.99 and directly from Flexibits.